Folio1 inscribed: 'Original Drawings from the Buddhist Temples at Ajanta. By Capt. R. Gill.' 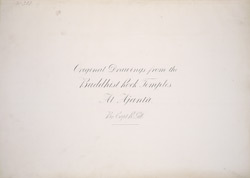 Stamped with East India Company Museum numbers from an album of 26 ground plans of the Ajanta caves and 16 folios of drawings of sculpture and architectural details in the Ajanta caves by Capt. R. Gill, in pencil, pen-and-ink and wash, dated c.1850. In 1819 a group of tiger-hunting British soldiers discovered the Ajanta caves in the jungles of a ravine. The magnificent cave temples are situated in a horse-shoe valley of the Waghora river in West India and consist of prayer halls (chaityas) and monasteries (viharas), built for the Buddhist community who lived there. The caves were in use for about eight centuries, and can be divided into two groups according to the early Hinayana and later Mahayana phases of Buddhist art. The first group was excavated between the second - first centuries BC, then, after a period of more than six centuries, the excavations restarted around the fifth century AD, in the Vakataka period. The caves contain some of the finest wall paintings of Indian art, important both for their technical mastery and wide-ranging subject matter, as well as magnificent sculpture, a unique surviving testimony to the achievements of Buddhist art in India.